What is wrong with you? Why do I need to purchase $70 dollars worth of color ink to print a black and white text-only document? I own a MFC-J415W and would recommend it to nobody. 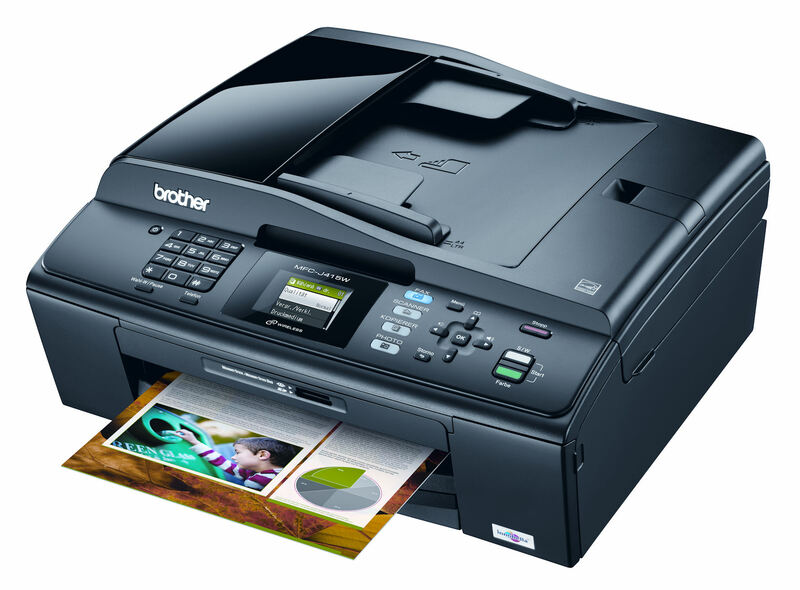 The Multifunction center works well for scanning and copying, but it has one fatal flaw: In the event that you run out of Yellow, Magenta, or Cyan, the entire printer shuts down and prevents printing until all ink is replaced. Minor inconvenience? Well, when the LC61 series ink packs cost over $70, I call it a scam. 6:44 PM Paul: Hello, David. Thank You for contacting Brother Chat Support. Just a moment while I review your issue. 6:44 PM Paul: I understand you concerns and I will be more than happy to assist you with your issue today. 6:45 PM Paul: I have a solution I can provide you with which will guide you through step by step instructions to help resolve the issue you are having. May I send you the link with these instructions now? 6:45 PM Paul: Please follow these steps to assist with your issue, was there anything else I can assist with today? 6:46 PM David: this does not address my issue. 6:47 PM David: The printer is reporting “can not print” due to no yellow ink. I am attempting to print in black and white. 6:47 PM Paul: If the message cannot print is on the display the ink cartridge will need to be replaced before you can continue printing. 6:47 PM David: But I am printing black and white. Why do I need to buy yellow ink for that? 6:48 PM David: isn’t there a way to print using the black cartridge? 6:48 PM Paul: Your Brother machine is designed to stop ALL printing operations (printing from the pc, printing received faxes and printing copies or reports) when any of the ink cartridges are empty. This is to ensure the life of the print head and maintain premium print quality. If the unit were to continue printing, print jobs and cleaning cycles would suction air from the dry cartridge and damage the print head. Even if you print in black only or change the print settings to MONO or GRAYSCALE to avoid printing in color, the programmed cleaning cycles would still suction the dry cartridge, because they are programmed to clean ALL the ink nozzles. The only way to continue printing is to replace the empty ink cartridge or cartridges. 6:49 PM David: thanks. I’ll buy a new printer, as that is much cheaper than replacing ink on this one. 6:49 PM Paul: Thank you for contacting Brother. Have a great day. If you need additional assistance with your issue, please contact us back though chat. So, there’s my advice: go buy another printer. It is WAY cheaper than replacing the color ink on this one every month or so. Update (5/24/2015): Alternatively, as someone pointed out in the comments, you can buy these cheap generic replacement cartridges for about 9 dollars from Amazon. This entry was posted in Technical Support and tagged brother, ink, MFC-J415W, printer on October 9, 2012 by David. I agree with this person 100%……this is horrible~~~~ sounds like a SCAM to me too!! I am out of BLACK ink…would want to use my color cartridges as I have on other printers………NOOOO GO!!! C’mon BROTHER….I will advise NO ONE TO BUY A BROTHER PRINTER after finding this out!!!! The ink for this printer is super expensive. I truly believed i could print in blk/white if i wanted but i’m out of cyan and apparently i would not be able to get my work done. I too think this is a scam. Unfortunately for us, this JW415 printer was purchased a long time ago and I cannot return it. I mainly print only in black and white and these cartridges do not last long, they are super expensive and I shouldn’t have to replace all of them if I am printing in black and white. This is the last time I purchase a printer that requires you to purchase these expensive cartridges or any printer that prints in color. I can go to the library and print in color, cheaper and it’s cheaper to buy a new printer than to purchase 4 cartridges for this printer. Not only does it not allow to print in black and white if you have no color; it will lie to you about your usage of the color cartridges. After realizing that an empty color cartridge prevents black and white printing, I bought only the necessary color cartridge and deliberating never used color printing ever again to avoid this issue(I only need black and white anyway). However, even when using only black and white printing; the printer is claiming that it’s color ink supply is running lower and lower with each print. Eventually it runs out of color completely and realize that you need to buy another brand of printer. BROTHER PRINTERS ARE A SCAM. We had the same issue with a Brother MFC-9330cdw. Obviously this is the way Brother tries to make more money off of unsuspecting customers. I will NEVER buy another Brother product again. I had been suspecting this B.S. for a while now…. Thanks for confirming my suspicions! Never again will I buy another Brother color printer! I’m getting rid of mine because of this issue. This is ridiculous that I have to buy one color ink cartridge just to print black. It’s a very expensive scam!! I’ve learned my lesson. I would rather toss it in the trash instead of letting someone else have this piece of crap. Thanks Brother Printer Company for giving it to me up the A*s with no Vaseline!!!!!! After having this same issue with a Kodak printer, I used Consumer Reports to research printers. They recommended Brother and said they had the best ink usage. I did purchase one and, indeed, the ink does last much longer than any other printer I have used. However, it does use up the color ink, even though I only print in black. My printer does not require I replace color cartridges to print in black but does pop up a message every time I print that I can no longer print in the color I am out of. I am as upset with Consumer Reports as I am with Brother because the specific reason I was furious with that Kodak is that it used all colors to print black and there were thousands of complaints when they took bankruptcy….of course, it didn’t put them out of business, it only stiffed their creditors. I guess all of these printer manufacturers have decided this is a great way to make billions; by following Kodak’s lead. I have always like anything Brother makes and am very disappointed in their seemingly descent into shabby business tactics. I agree this is ridiculous. We hardly use the colour print, so surely the cartridge does not need replacing at the same time. You should be able to change just the black to enable the machine to print again. Is the machine not sophisticated enough to determine when one cartridge or another is empty? Never mind the cost what a complete waste of ink! !